The factory was opened in 2006/2007, some of the production lines were moved from Maruti Suzuki’s main plant in Gurgaon, which is situated in about 20 km distance from Manesar. The Manesar plant manufactures different models from the Gurgaon plant; there is little integration or dependency in terms of production process between these two factories. The factories source parts from similar suppliers, but the larger suppliers have built separate units for the new plant, e.g. Rico’s main plant supplies 90 per cent to the old Gurgaon plant, only 10 per cent to Manesar. The factory employs around 3,500 to 4,000 workers and churns out 1,200 cars a day. The assembly lines run on two shifts, the rest of the plant (weld-shop, body-shop) runs 24 hours. The production volume has been increased by about 200 cars a day during the last two years. The strike hit Maruti Suzuki in a relative ‘boom’-period, some weeks before the conflict in Manesar, Maruti Suzuki announced to open an additional plant, probably in Gujarat – a location closer to the export harbours. Maruti Suzuki is a dominating company in the region and closely related to the political machinery. This is mainly because of the industrial dependency of hundreds of smaller production units, reaching down to slum production and small work-shops, partly because the state still holds shares in Maruti Suzuki and partly because Haryana state sources a fair chunk of tax revenue from Maruti Suzuki. In 2010 the company paid around 13 billion Rs tax to the regional state. In the Gurgaon plant the salary of skilled workers adds to 30,000 – 40,000 Rs including the overtime and incentives, whereas the skilled labourers at Manesar get only around 13,000 to 17,000 Rs. 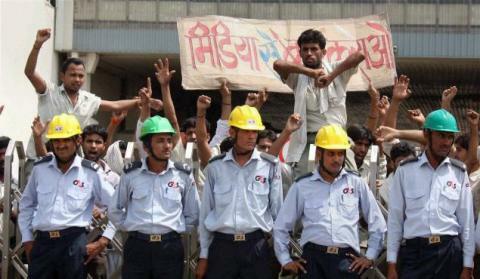 After the lock-out at the Gurgaon plant in 2000/01 around 2,500 permanent workers were replaced by temporary workers. Unfortunately we have little insights how these workers in Gurgaon saw and debated the strike of their casualised work-mates in Manesar. The factory itself is situated at the fringe of a huge industrial area, location for around 500 manufacturing units, partly garment factories, but dominated by automobile suppliers and the Honda motorbike and scooter plant – see satellite picture. The workers themselves live in four – five ‘villages’ close to the industrial area. Some of them – mainly permanent workers – live further away and arrive in company buses – they have to pay 600 Rs per month for the company transport.